The most important thing is that at the Transfiguration, the disciples on the mountain saw the two prophets, Moses and Elijah, conversing with Christ. All of this demonstrates Elijah’s special position among the prophets and in the consciousness of the people. They saw Elijah returned even in the person of Christ, when they heard his teaching and witnessed His miracles. Christ asked: “Who do people say I am?”. And His disciples answered: “Some say John the Baptist, others Elijah”. Elijah was from Tishbe, a town east of the Jordan, which is why he is known as the Tishbite. He was active in the days of King Ahab, who reigned from 873-854 before the birth of Christ. Ahab, and particularly his wife, Jezebel, were impious people and Elijah railed against them. Jezebel wasn’t Jewish and was herself the reason why the faith became contaminated with idolatrous customs. She persecuted Elijah, who was continuously forced to flee and hide. Jezebel hounded Elijah in much the same way as Herodias did later with John the Baptist. The first great sign he gave was when he prayed and fire rained from the sky. At the command of Ahab, four hundred pagan pseudo-priests had assembled, under the protection of Jezebel. Elijah proposed a competition with them. He told them to lay wood on the altar, along with the bullock to be sacrificed; this they did and then they started walking around it, shouting the whole day to their false god, Baal, to send down fire, “and there was no voice and no answer”. Then the Prophet said to them: “Stand aside and I will make my own burnt offering”. He made his own altar, then got the bystanders to douse it thoroughly, three times, with water so that it was soaking wet, and then he prayed. Fire fell from the heavens and devoured the altar and the offering upon it. After this sign, the people seized the pseudo-priests and Elijah punished them severely. Jezebel was furious and hounded the prophet yet again, so that he retreated high up on Mount Horeb, where, five hundred years earlier, Moses had heard the voice of God from the bush which was in flames but unburnt. Elijah hid in a cave there, and God taught him a powerful lesson. He said to him: “Go to the summit and you’ll see Me. There’ll be a strong wind; there’ll be an earthquake; you’ll see a fire; and a gentle, cool breeze will also pass. I won’t be in the storm, or in the earthquake, or in the fire, but in the whisper of the breeze”. 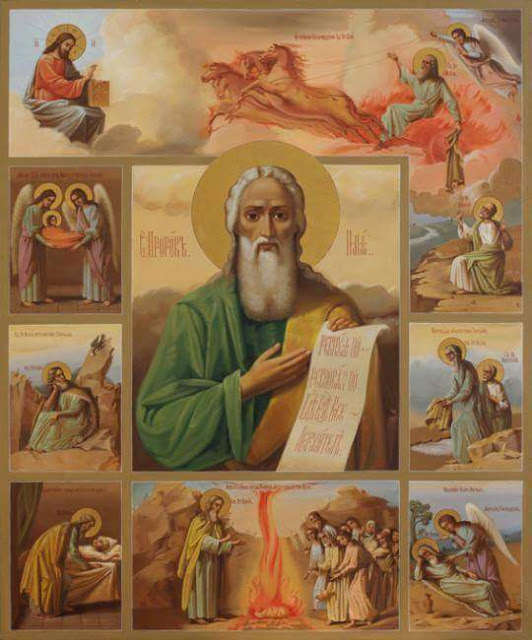 The prophet Elijah was someone who was entirely consumed with divine zeal. His life was effulgent and his death an ascension into heaven “in a chariot of fire”. Amen. Source: Εικόνες έμψυχοι, Apostoliki Diakonia, pp. 246-8.